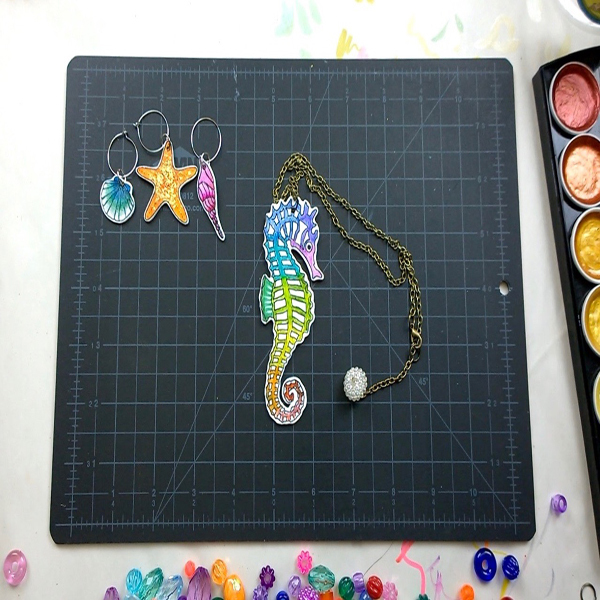 Project Description: Have a night in creating fun Nautical charms using Grafix Artist Series Shrink Film with designs from artist Gina Lee Kim. 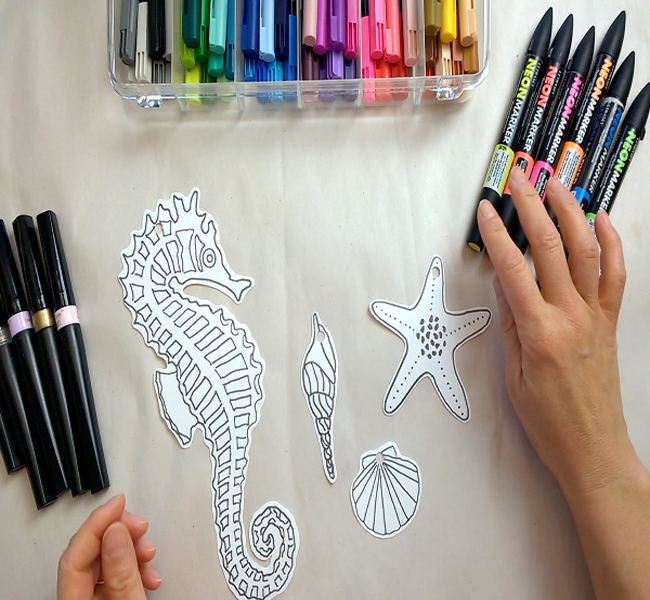 Based on your preference you can either cut out the designs first or after you have colored them in. If you do cut the designs out first please remember to create a hole using a standard hole-puncher before you bake. 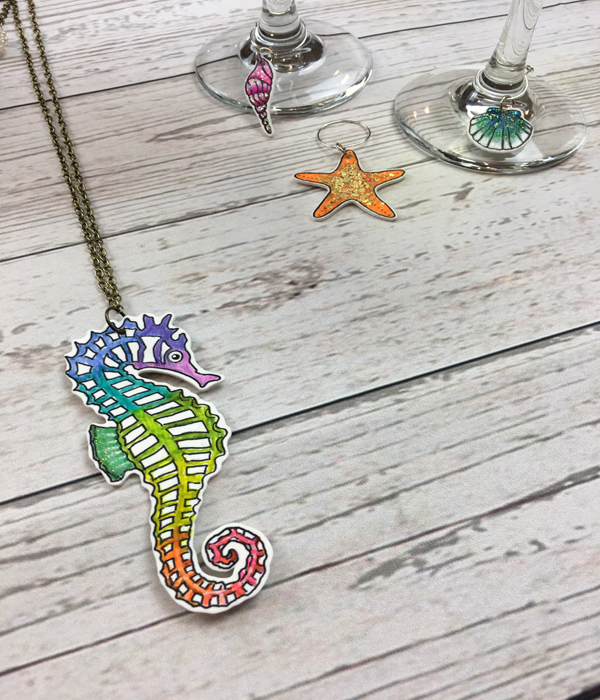 To color your designs you can use whatever water-soluble, dye-based makers you have. 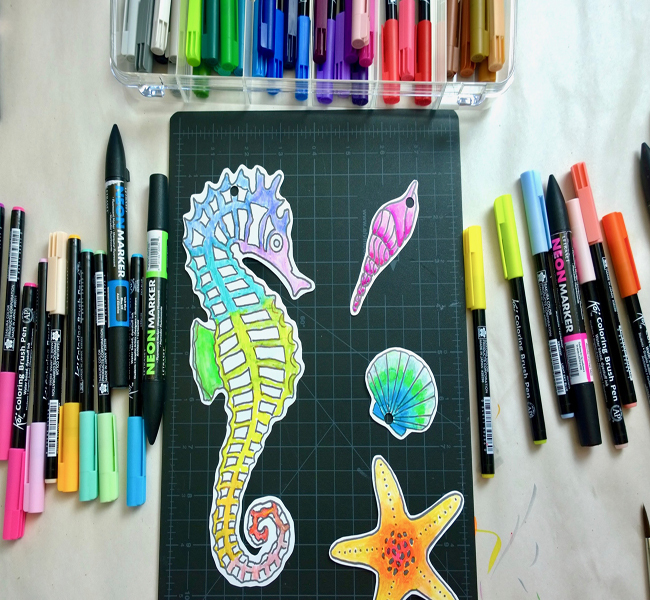 Many fluorescent highlighters and neon water-soluble markers will work surprisingly well so test out the supplies you have. 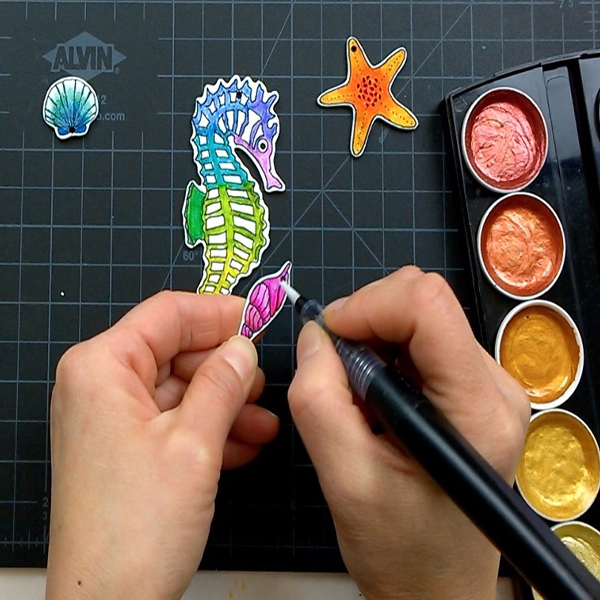 In the video, Gina uses Koi Coloring Brush Pens and Letraset Neon Markers to lay down initial foundation colors. Note: Remember, Shrink film is very forgiving so don’t worry about achieving the smoothest of pen work. It is optional to blend colors with a damp paintbrush. Shrink the film according to package instructions. You can use a conventional oven, toaster oven or heat gun. Note: If the plastic curls, you can gently flatten piece with a metal spatula then let it cool. If you’d like to add some shimmer and iridescence to your shrink film pieces there are two options. The first is to use a sparkly brush pen (e.g. Spectrum Noir in Crystal Clear) loaded with metallic watercolor (e.g. Prima Metallic Accents). 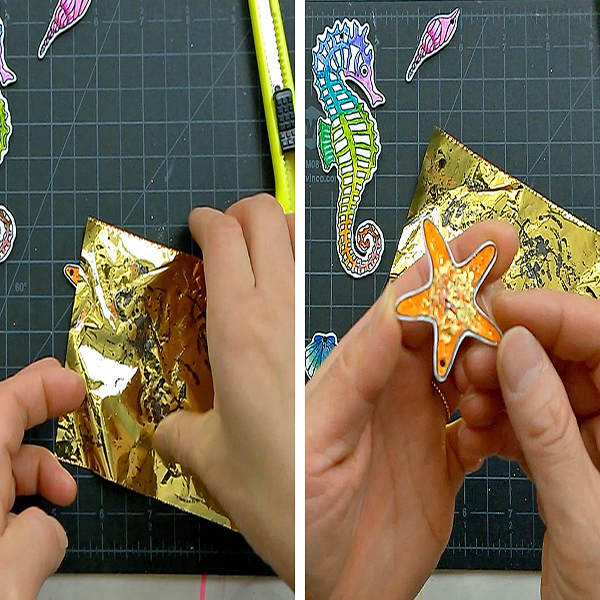 The second option is to use foil sheets. Follow the gluing instructions on the package and let dry. The foil will leave another layer of shininess to the design. Note: For the first option there isn’t any need for water—the moisture from the brush pen is enough and leaves a concentrated, super iridescent surface. 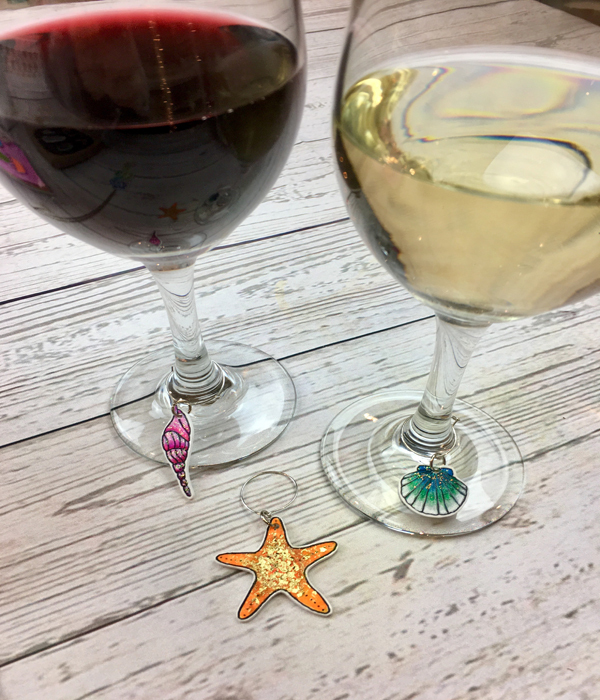 Lastly, add the jump rings to your designs and either your necklace chain or wine glass ring.